Beef Burger No. 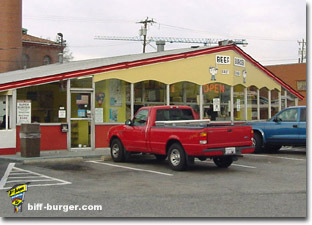 2 of Greensboro Inc.
"Beef Burger" located in Greensboro, North Carolina, is a restaurant that was former a Biff-Burger and is still called that by many of the locals. 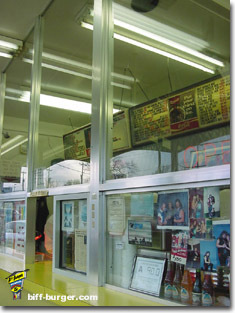 It is believed that this is the last remaining "Beef Burger" restaurant still remaining in the country from the once famous Biff-Burger. Ralph, bought his store in 1971, after managing it nearly 10 years. It was only a couple of years later that the Biff-Burger parent company disappeared. In May of 1981, his 10-year contract with Biff Burger had expired, however since the parent company had dissolved, the contract could not be renewed. At the time, Ralph was afraid someone would visit him demanding past franchise sums, so he reluctantly decided to change the name to Beef Burger, the closest he could come to Biff. 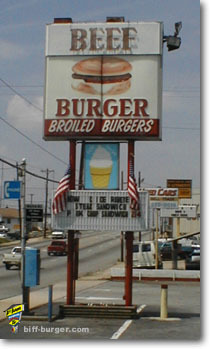 As other Biff-Burgers converted to something else or closed due to unavailable support from the Biff-Burger headquarters in Florida, Ralph held on throughout the years. He had his own cups, wrappers and bags printed. He kept the cartoonish Biff boy trademark alive in his ads and to this day, the "Biff" boy lives on as the "Beef" boy! Most importantly though, Ralph kept the "Roto-Broiler" rotating and the secret sauce - the real signature of a Biff Burger ! Factoid: Beef Burger was featured in the movie "Bull Durham", (1988), starring Kevin Costner, when the Durham Bulls Baseball team came to Greensboro to take on a minor league team. 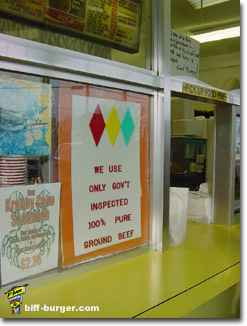 Besides, the Biff-Burger Drive-In in St. Petersburg, Florida, the Beef Burger in Greensboro is indeed a Biff-Burger too, with the same service counter, equipment, cooking practices, sauce, chain identifying items, and building architecture used in other former Biff-Burger Drive-Ins; only the name has been changed since National Biff-Burger System (NBBS) and its parent company went under and could no longer provide support to its franchised drive-ins. 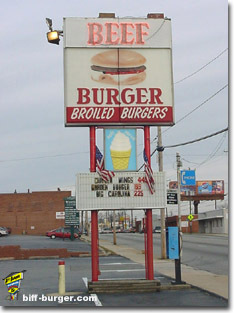 In May 2005, Ralph Havis, owner of the Beef Burger, located at 1040 West Lee Street in Greensboro, North Carolina, started an annual tradition by hosting an annual Customer Appreciation Days event in celebration of his anniversary. For two days, every year in May, Ralph offers his customers hamburgers (biffburgers) at a price which reflect the number of years that Ralph has been managing the Beef Burger in Greensboro. 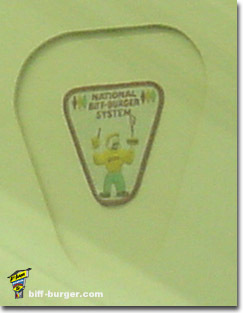 For images of Beef Burger's past anniversaries, starting with the 44th Anniversary event, click "here" or the bumper sticker above. 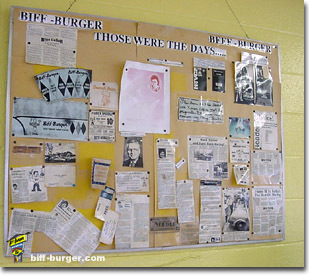 The Beef-Burger, referred to as Biff-Burger by the locals, celebrated its 50th Anniversary (1961-2011) on Tuesday, May 3, 2011. Please help continue supporting Ralph's Beef-Burger by stopping in for your favorite burger! 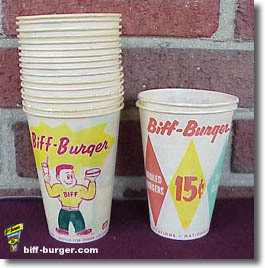 The logo to the right, which is still used today, was derived from the "Original" logo used by Biff-Burger. 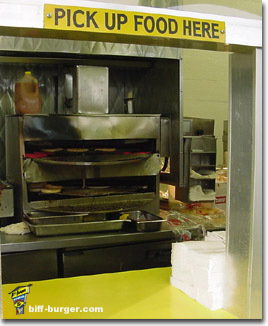 The "Beef" boy logo indicates, "Roto-Broiled", which is consistent with cooking practices used by Biff-Burger Drive-Ins. A special thank you goes out to Robert D. Delius for his extensive on-going research and providing many of the images of Beef Burger posted above -Thanks !